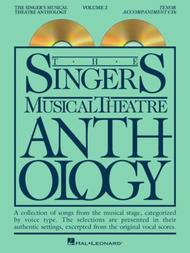 The Singer's Musical Theatre Anthology - Volume 2 - Tenor (CD only) (Tenor Accompaniment CDs). Composed by Various. Edited by Richard Walters. For Voice (Tenor voice). Hal Leonard Vocal Collection. Play Along. Accompaniment CD. 8 pages. Published by Hal Leonard (HL.740234).ISBN 0634061844. Play Along. 9x12 inches.Songbook available separately (HL.747032).